Oswego, NY – Pathfinder Bank has lent their support once again to the Tri-Oswego Triathlon, according to Tri-Oswego Race Director Shane Broadwell. 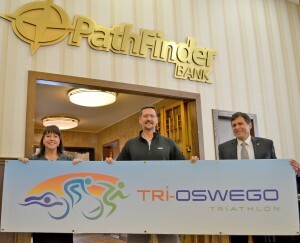 The Tri-Oswego 2013 Triathlon is scheduled for June 15th in Oswego, and Pathfinder Bank has joined on once again as a sponsor of this year’s event. Shown pictured in support of the triathlon are from left to right: Beth Alfieri, Assistant Vice President at Pathfinder Bank; Shane Broadwell, Tri-Oswego Race Director; and Ron Tascarella, Senior Vice President/Chief Credit Officer at Pathfinder Bank. For more information and/or to register for the 2013 Tri-Oswego Triathlon, please visit www.tri-oswego.com. The Tri-Oswego 2013 Triathlon is scheduled for June 15th in Oswego, New York. The USA Triathlon sanctioned event will include a Sprint, Intermediate, and Sprint Relay Tri race again this year. The Novelis Kid’s Fun Run, and the new Tri-Oswego Splash and Dash for children 11-15 years of age are also planned for June 15th. Additional sponsors for the event thus far include: Novelis, Michelob Ultra/Eagle Beverage Company, Step One Creative, Xterra Wetsuits, Best Western Captain’s Quarters, Quality Inn & Suites Riverfront, Maines Paper & Food Service, Murdock’s Bicycle, County of Oswego, City of Oswego, Oswego Health, OswegoCountyToday.com, Cre8 Solutions, NBT Bank, Oswego YMCA, The Captain’s Club, Palladium Times, NRG, Oswego Printing Company, Beacon Hotel, Advantage Carpets, Universal Metal Works, In Vogue Salon and Spa, Oswego Harborfest, 342-ABUS, Taylor Rental, Aspen Athletic Clubs, and Butler Disposal. Athletes that register between May 1st 2013 and June 7th 2013 will pay $100 for the Sprint, $110 Intermediate and $240 for the Sprint Relay. There are no refunds and registrations are nontransferable. Participants under the age of 18 must have a parent or guardian sign for approval. All proceeds will benefit youth development programs throughout Oswego County through the Oswego County Sunset Group. For more information and registration details on the Tri-Oswego Triathlon, Novelis Kids’ Fun Run, and the Tri-Oswego Splash and Dash please visit www.tri-oswego.com or Facebook/Tri-Oswego.